Linlithgow Rose booked a fourth-round trip to Blackburn United after beating Oakley United 3-0 in the Scottish Junior Cup. However, the away win – courtesy of goals by Colin Strickland, Ruarhi MacLennan and Tommy Coyne – came at a cost. Captain Colin Leiper suffered a bad facial injury which could rule him out of action for several weeks. The player was taken to hospital for stitches to an eye wound and received treatment for a possible broken nose. Boss Mark Bradley was pleased with the win but more concerned with the injury to Leiper. “There was a coming together of him and one of their players with Colin coming out worse. It now looks like his nose is not broken and he’s strapped up. There’s no concussion and we don’t know if he’ll be fit for the derby against Bo’ness next weekend. “All this on top of a bad injury to Owen Ronald, whose been a big part of the team this season with his goals and assists. “It was particularly good to get the strikers back on track with Coco and Tommy, who broke a Linlithgow record in the process. Musselburgh are feeling very hard done by after losing away to Ayrshire giants Hurlford in hugely controversial circumstances. The East Lothian side ended up with only eight players on the pitch and produced a fantastic comeback when down to nine players. They were trailing by a goal with both Chris Gray and Declan O’Kane sent off when Mathu King equalised with six minutes remaining. Mussy goalkeeper Ally Adams was then sent off, with Hurlford scoring a last-gasp winner. Newtongrange were held 0-0 at home by Cumbernauld United and will face a replay this Saturday – another game for Nitten to catch up on in an already busy schedule. 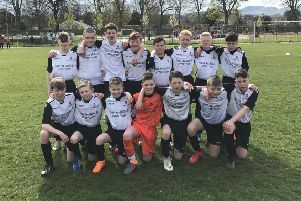 Whitburn produced one of the best results of the day as they swept aside Benburb, a team they previously met in the semi-final of the competition in season 1999/2000 – the year they won the competition. On the scoresheet for Whitburn in a 4-1 win were Martin Russell, Andy Thomson and Gary Brass with a super double.